We weaved thru the morass of moraines left by the receding glacier and were soon approaching the cracked extension zone of the glacier. Trending left up an easy ramp, we bypassed the jumbled rapids of the frozen river of ice. On a fatter year this would turn into an epic pile of mushroomed ice pillows to be smashed by an intrepid skier. After the ice-fall a hard right brought us to the exit chute and booter to the summit ridge. The top of this section was steep and exposed - to prevent pealing off into outer space we dug our hands into the firm snow. Good, clean, fun. Leaving the cool shade of the north face, we stepped into the cooking afternoon sun. Below us, wet slides were rumbling down the south faces. The views were incredible, but it was time to hurry to get to the top and off the hot snow as soon as possible. 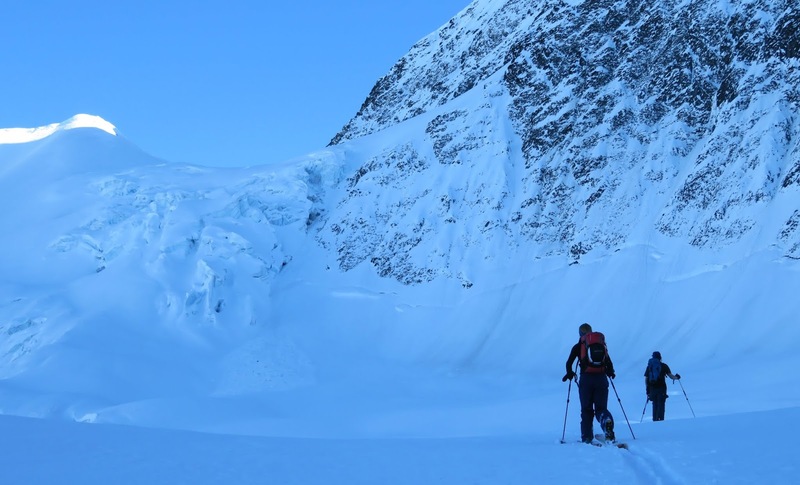 With vivid memories of sprinting off of a failing cornice the size of my house on a hot February day years ago, we made sure to give the dangling snow a large berth. Thousands of feet below, an unfrozen Kenai Lake was shimmering away. All I wanted was to bask forever in the warm summit sun, but we were 10 miles from the car, and more importantly, had to get off the ripe south face of the summit block. So many new views for me, what a treat to get a perfect day in February. We ripped our skins, ate our snacks, and readied to drop off the summit. The skiing was really good, but it wasn't time to relax knowing we were on a ticking time bomb. After a traverse filled with sidestepping, slipping, and groveling through manky snow over lubricated loose scree we dropped into the hanging ramp. At fatter times this is probably fun skiing, but this February the steep styrofoam snow strip choked down to the length of our skis. 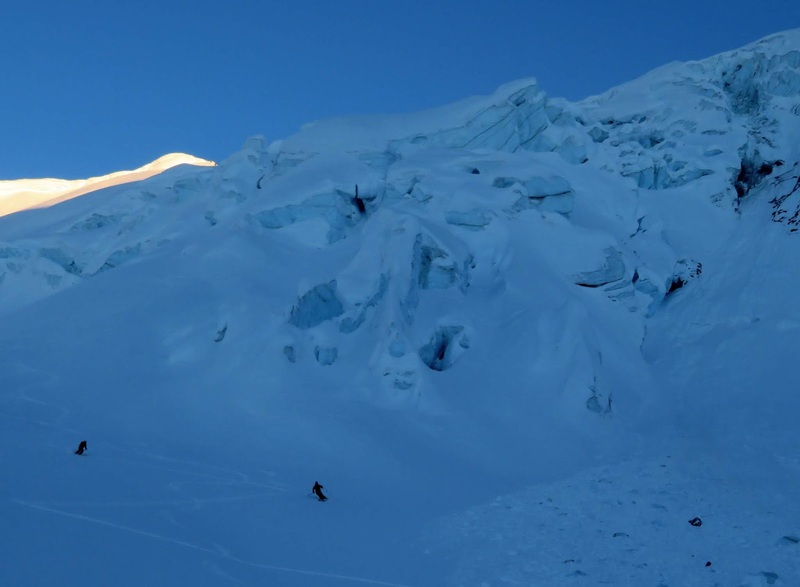 As the fall line of the exposed ramp curved into the chute we could relax our turns. Onto the glacier it was a matter of winding around stretched crevasses and chasing fingers of light into the shade. We played leapfrog thru the skintrack as the glacier curved away below. Then as the pitch mellowed out Alyse and Neil party-skied down in their best Warren Miller imitation. On the lake it was getting dark, for some reason I hadn't packed a headlamp, so the bobsled run back to the car was extra fun. 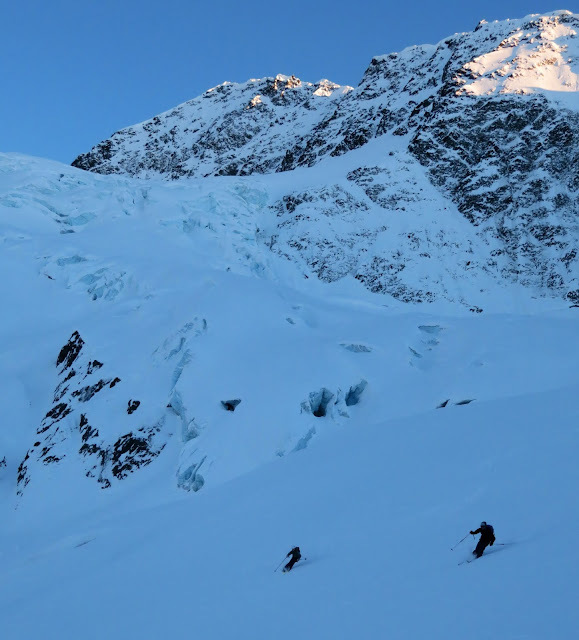 This is a classic day - enough of an approach, a beautiful glacier, steep exposed skiing, then soul turns back to the lake.